Goldealers today received a gold figaro neclace from a member of the public. This particular item was not hallmarked and was a beautiful piece, except for one thing. It had a very ugly burn mark on it. We called the customer after testing the item to confirm the price which the customer was delighted with and payment was sent. But what’s the story about the burn mark? The customer explained to us that she took her bracelet to be valued at her local jeweller. Without even asking or explaining the process, the jeweller took out a bottle of acid and dripped it onto the jewellery. The jeweller, having tested and confirmed that the item in fact was 14ct gold, offered a price to the customer. The customer was not happy with the rate she had been offered and the jeweller returned the item to her. Imagine her disgust when she received her 14ct gold figaro chain back with a dirty great big acid burn on it – she only asked for a valuation, and now she can’t even wear the thing! The acid test is also known as the Troy test. It is a mix of Hydrochloric Acid and Nitric acid and depending on the colour change with the gold, a jeweller can determine the approximate purity of the gold item. Following this incident, she was forced to sell the 14ct gold figaro neclace and after a search online, found us. I guess the reason I am writing this post, is because not only should you be careful who you sell your gold to (in order to get the best price), but if there is the slightest chance you are going to change your mind, you should also be extremely careful who you ask to value your jewellery also. 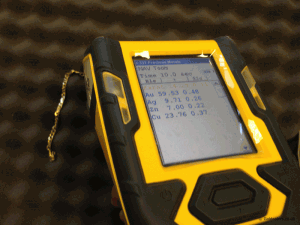 The acid is a tried, tested industry standard way of testing precious metals. But if this particular customer had sent her jewellery to Goldealers Ltd first for the no obligation valuation, we would have been able to test the item within seconds. More importantly, we would have been able to return the item to her un-tarnished if she decided to change her mind. What’s so different about the way Goldealers test jewellery that doesn’t damage the jewellery you may ask? Simple – due to the amount of jewellery we test and purchase on a daily basis, and the high rates we pay, the Acid test is not accurate enough or quick enough for our needs. We use X-Ray flourescence technology to test jewellery which is a form of non-destructive testing. If you are going to get a jewellery valuation from your local jeweller, always ask for a ‘per gram’ rate. You can then do the calculations because 9 times out of 10, you know if your jewellery is 14ct gold or not! If the jeweller wants to put acid on your jewellery, stop them. Ask them what the price would be if it passed the acid test. Ensure that you are happy with this approximate valuation prior to the jeweller putting acid on your beloved gold jewellery. Alternatively, send your jewellery to Goldealers Ltd for a free, no-obligation jewellery valuation. If you change your mind, your items will be returned to you free of charge – what’s more it won’t be tarnished.